Gildeas Solicitors has experienced its busiest summer period in the firm’s history after recording a 22% increase in July of private referrals for personal injury cases compared to the same month last year. The firm’s director, Sanjeev Bali believes the growth is due to a significant change to client service, which now involves a bespoke, personal approach for those who have sustained serious or life-changing injuries. “Personal injury cases tend to follow a seasonal pattern, whereby our busiest months are September to March. However, we have noted an increase in private referrals this year, with busier than usual summer months. “We have made a number of robust strategic decisions in the past year, including a commitment to building better relationships with our clients from the outset. The firm has increased staffing levels to help deliver the new tailored service for the most serious cases and it is likely additional resources will be required later in the year to support future growth. 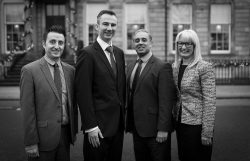 Gildeas Solicitors Ltd was founded in 1986 and has offices in Glasgow and Edinburgh. It specialises in personal injury claims in road traffic accidents, work accidents and medical negligence cases, as well as employment law and health & safety issues.